Phaedra Parks On Accusations of Hitting On Shamea's Husband: "The Thirsty Tell Lies"
Despite Kenya Moore‘s strong support for Kandi Burruss‘ truth-telling, Phaedra Parks is steadfast in her belief that Kandi doesn’t take ownership for her messy behavior. The Real Housewives of Atlanta star writes in her Bravo blog this week that she is tired of Kandi’s deflection and Shamea‘s thirst, pretty much denying her alleged flirtation with Shamea’s husband. She also shares her thoughts on Cynthia Bailey‘s group appointment regarding her breast implants. TELL US – TEAM KANDI OR TEAM PHAEDRA? WOULD YOU INVITE YOUR FRIENDS TO YOUR BREAST IMPLANT EXAM APPOINTMENT? 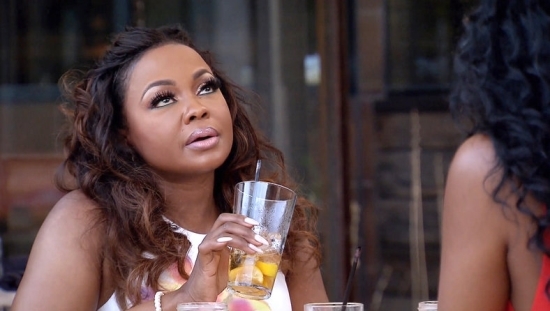 DO YOU THINK PHAEDRA WAS HITTING ON SHAMEA’S HUSBAND?